Canadian actress Taylor Russell was on hand for the season one premiere of her Netflix show, 'Lost in Space' at Arclight Hollywood Cinerama Dome in LA last night(April 9th). 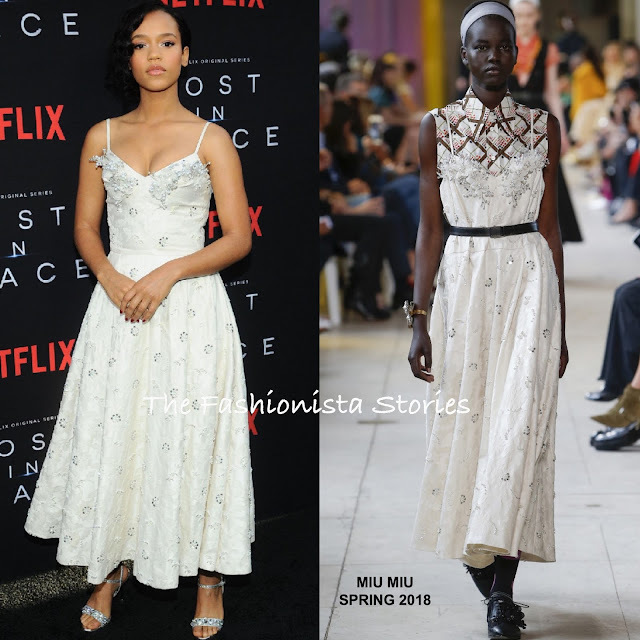 She hit the black carpet wearing a MIU MIU SPRING 2018 white & silver embellished ankle length dress with floral embroidery, a v-neckline and spaghetti straps. Minus the creases on the bodice, I would say that this is pretty look for the actress and a great choice for the premiere. A complimentary beauty look and silver sandals finished up her look.